As a side note, it is believed that the spare parts business from Brockmann was taken over by the company Ritter years ago. In their latest auction we are pleased to see many wonderful treasures including a rare E 800 LMS. The piece’s provenance (history) is incredibly important as it was sold by the auction company in 2001 for 40.000 DM. While some Marklin pieces have fallen in price recently, top rarities such as the E 800 LMS have not only held their prices firm but also gone considerably higher depending on condition, originality, and the provenance of the piece. Another lot includes the rare Marklin 416 station which in some versions bears the controversial symbol of the Nazi party leading up to WWII. The particular lot in this auction does not show the symbol, and the auction house is prudent to point out that the flag is a replica. 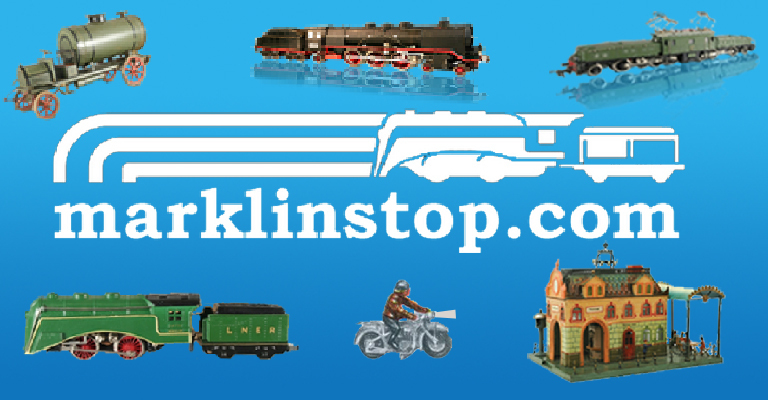 Many Marklin sellers on eBay and elsewhere do not always accurately describe their pieces, leaving out that certain parts are reproductions or repainted. We are pleased to see here that this auction house pays particular attention to accurately describing such details. The auction also features some larger gauge items (O and I Gauge) including a French Mountain steam locomotive ME 70 12920. The “70” in the model number means the locomotive is equipped with the improved remote reversing system as opposed to the hand-reversing of the “66” series. This particular model was sold in several different varieties. The black version came with wheels that were either the typical red or black as seen in this lot. It is not known what caused these variations – there is perhaps a correlation with more red-wheeled ME locomotives showing up in the American market. Here again the auction house is careful to point out that the box is a replica. Since the box is slightly used and worn this could be particularly difficult for collectors to discern from an original box. However, with careful examination of the box labels, particularly the colors and stampings, the label is an obvious reproduction. 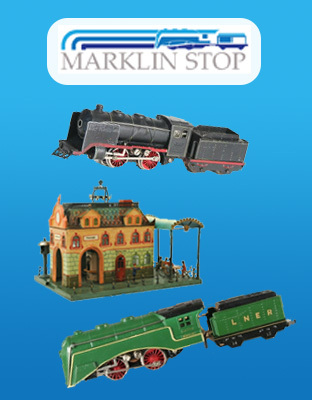 In O Gauge is a fantastic reproduction by the company HEHR (or similar manufacturer) which is known for producing quality reproductions of many of Marklin’s models from the 1920s and 1930s. HEHR only reproduced this locomotive in Gauge O, which Marklin never originally produced. Marklin only produced this locomotive in Gauge 1, which HEHR scaled down. Twerenbold, however, did product a replika of this locomotive in Gauge 1. The Rheinuferbhan is a famous railway in Germany that connected the cities Bonn and Koln (Cologne). All in all, the Muenchner Spielzeugauktion presents yet another fantastic auction for collectors. And this time, the auction is at the Hans-Peter Porsche Traumwerk in Germany near the Austrian border, which we covered in another article. The museum shall be a wonderful venue for an auction with such incredible pieces.